I must appreciate your efforts to make my online life as simple as scratching my forehead. You have so many services that whenever I visit a website that offers something spectacular I secretly wonder whether you are behind it. But, recently you started putting a nice menu on the top of your sites to enable quick access to your other services like youtube, reader, yahoo (oops, looks like you havent bought them yet), but I must say that your menus lack common sense. Let me explain why, this menu hides your services that I use day-in / day-out (for eg. 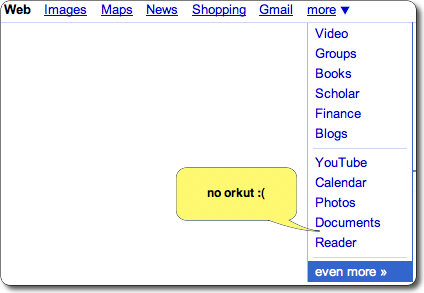 orkut) and displays the ones I rarely use (google scholor, oh come on!). You are the big brother, you know which websites I go to, when I take a coffee break (oh well, you dont already, but who knows, may be you already know this). So instead of bulldozing me with a menu that is as flexible as my driver’s license examiner, why don’t you instead show me your services that I access most. Are you sure that it displays the rarely used options???? I dont think so. I think the menu changes from country to country, as orkut is not popular in US /Europe, it is not available in the menu. but it is there with indian google homepage. The menu just varies from homepage to homepage. but not dynamic, I think so.. I agree that they have customized the menu based on country of the browser, but my guess is thats a cop-out option. I guess a better way is to show services that the user has signed up for and using. how are you doing these days btw? Yeah, they can very well do that as Google is the best in providing relavent content. But I find a problem in that way, the user may never try a new product of google untill that is so familiar. right? that might be the reason behind that. We cant under estimate Mr.G yaar. I am fine and doing great.